A prospective client said he wanted me to take out some beavers that were plugging up a drainage ditch. We rode out together to see the property. “There’s the ditch,” he said, pointing to a line of trees across a field. It looked like the ditch ran about a mile and a half from the road, down to where it entered a creek. He had brought a good set of aerial maps to back up the gesturing. I dismissed that offer. I did not want to take a chance driving my truck on that dirt path, especially after a rain. Besides, I like trapping off my four-wheel ATV. With the four-wheeler, I can go about anywhere, anytime. And, in truth, I can go just as fast on field roads as I can with the truck, if not faster. You can only bounce so fast down a field road before your head starts hitting the roof of the truck. I could unload the four-wheeler right there at the road and go in any direction by any route I chose. As long as I didn’t have to cross deep water, I’d be fine. As we pulled away, he said he didn’t know where any of the dams were. I looked out the window. “There’s one right there,” I said, pointing at a small dam in the ditch just off the road. He wanted me to look at another property while we were out there. “If we could get across this creek,” he joked, “we could go straight there.” Instead, we backtracked 10 miles to get on the other side of the creek. As is my custom, I consulted my own maps that evening. For years, I relied on paper topo maps, and still do to some extent. But I’m no stick-in-the-mud. Today, I may log on to the internet and view a location with something like Google Maps. First thing I found was a road that crossed the creek a couple of miles from the ditch, considerably less than the 10-mile detour the landlord had taken. My map also showed that the ditch flowed into an oxbow off the main creek, which had been channelized into a big, straight drainage canal. Much of the old creek bed formed oxbows on either side of this canal. Now that I had the lay of the land, I went back to scout on my four-wheeler. The dam I had spotted from the truck was easy to relocate. It was some type of secondary “catch” dam. Beavers build these smaller dams below their main dam. Each small dam creates a terrace of water, which lowers the pressure on the base of the dam above. It’s an effective way to reinforce the base of the main dam. The main area of activity would be above there, so I rode up along the ditch, picturing its progression over time. Twenty years ago, the ditch had been clean. But each successive year, vegetation had grown a little farther out from the bank, forcing the farm machinery out into the field. The ditch banks were now 20 feet wide, choked with honeysuckle, briars and trees. I couldn’t actually see the ditch let alone any beaver dam that might be in there. I just kept my eye out for some sign. I saw a few beaver-chewed trees, visible by the bright stumps. And I saw one very large tree that the beavers were trying to cut. Then I came across a deer trail leading straight into the ditch. I dismounted and went in on foot to take a closer look. Sure enough, there was the beaver dam. The deer were using it to cross the ditch. I tied a flag on a blackberry briar to mark the spot. On down the way, several small gullies fed into the ditch. These, too, were overgrown, and I could not penetrate them on the four wheeler. I had to leave the ditch bank and circle around the outside. At the upper point of one of these little drainages, I found several piles of cat droppings. I’d for sure be bringing some dirt-trapping equipment next time through. By the time I got around all of those gullies, I was a long way from the ditch and the point where it fed into the creek. The whole bottom down there was overgrown and virtually impenetrable. So I drove out across the field to where the dirt road hit an oxbow of the creek. I nosed around there, looking for another deer trail, but couldn’t find one. Finally, I did locate another dam, of sorts. But this wasn’t necessarily a dam of beaver construction. It looked like a large tree had simply fallen across the creek, accumulated silt and debris, and eventually become a dam. There were a few peeled sticks lying around, so I knew there were beaver back in this oxbow, too. I had a couple of 330s in the ATV box, and I decided to set one. But where, in that jumble of limbs, was the crossover? I made a guess and set the trap. I hurried down the two-track, straight back to the truck. Then I circled back to the little dam by the road. The water above the dam was only knee deep with a few inches trickling below the dam. I checked for a crossover and I set a 330 in the path above the dam, where I could get it submerged. 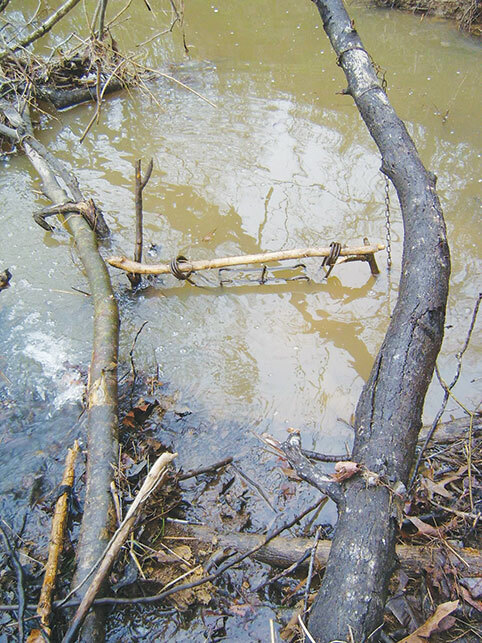 I used some sticks to fence it down and set a dive pole overtop to get a beaver to duck into the trap. Since this was a nuisance job, I didn’t want dead beavers lying near the dam to spook the others. So I stretched the chain all of the way back up the ditch, as far as it would go, and staked it on the bank. On the first check, the trap held a small beaver. And, as hoped, the beaver had wound itself up in the trap chain, pulled away from the dam and off to one side. I remade the set. I went on up to the main dam and set a 330 in the channel below. I made three sets at the cat sign. I put a snare in a trail that led back into the brushy draw. Then, in the edge of the field, I made a big-hole set with a little stump for backing. I made a urine post set nearby. Now it was on to the creek where I was sure that first 330 would hold a beaver. That went on for a couple more days. I couldn’t imagine a beaver would not move through there in three days. So I took a closer look and way off on the far side of the dam saw a strip of slack water. Another tree had jammed itself in perpendicular to the dam, and its trunk was angling the current toward the middle of the stream. Behind the trunk, where the water was slack, the swimming might be easier. I got out another 330 and put it in what appeared to be a path through the jumble below the dam. I stabilized the trap by running a pole through the upturned spring eyes and setting that on a couple of forked sticks, like a goal post. The support stick became the dive pole, as well. I wired the trap to a limb on the tree. That was the answer. The set caught three beavers and an otter. The original trap sat untouched for a week. On the next check, I found another little beaver at the little dam. But the 330 I had set at the main dam was fired and empty. I assumed that was a smart beaver. I tried submerging the trap in a different location, but no dice, so I broke out a foothold trap. I brought in a concrete block for an anchor because I was antsy that the water was only marginally deep enough to drown a beaver. Sure enough, the water wasn’t deep enough. On the next check, I found a live beaver with the block pulled up on the bank. I abandoned that set and went back below the dam with a snare. Beaver that are shy of bodygrips will often charge recklessly into a well-placed snare. I set the snare about 10 feet from the dam in the channel leading away. I made an 11-inch loop, one-third above and two-thirds below water. That did the trick. I caught a bigger beaver, and it really tore up the area at the base of the dam. Meanwhile, out in the field, I took two bobcats in the big hole. The traps were on grapples, and the cats got far enough away to not ruin the set. Then the coyotes found it. They weren’t fooled at all. They moved the backing and scratched out the trap. I remade the set, and the night before I pulled traps, one unlucky fellow made a misstep, and I added a coyote to the catch. Up the ditch, at the little dam, I took a bunch of small beavers before that set went dead. Then a smart beaver came along and moved the trap and the forcing out of the way. There was at least one left. I hadn’t had any action at the main dam, so I rigged up the foothold again and made some more sets. I tried a couple of bait sets and put another snare out, but the beaver purposefully avoided all of these. I could see its tracks in the mud. I was at my wits’ end when a horrific thunderstorm blew out the dam. It gave way right at the base, where the snared beaver had weakened things. That lowered the water level in the ditch by 4 feet. I found my foothold trap buried in the debris. Using a shovel, I was able to prod around and find the drowner cable. With some effort, I freed the trap. I saw nothing more of the smart beaver. I guess it moved on when the dam broke. It turned out to be a profitable little trapline. The cats and the otter provided a nice bonus. I turned in a bill to the landowner for the beavers I had caught and told him that Mother Nature unplugged the ditch for him, free of charge.